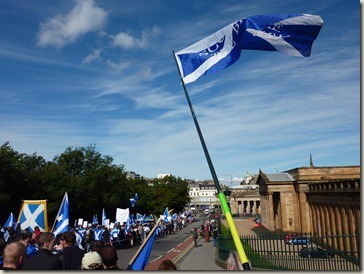 Yesterday I attended the first of three annual March/Rallies that are to be held in the lead up to the Scottish Independence Referendum in 2014. The last (and only previous) time that I was part of a public expression of opinion would have been towards the end of the Thatcher government in the 1980s, when I was part of a protest against Michael Forsyth opening the East Sands Leisure Centre in St. Andrews. I’ve nothing against the fine institution that is the East Sands Leisure Centre, I should hasten to add; just the company it kept at the time. That was an angry protest; very civilised, because it was St. Andrews, and quite small scale, but angry at the things that the government of the time was doing. Although it was also very civilised, yesterday was otherwise a different kettle of fish. It was a bit bigger, for a start. 9,500 according to the organisers; 5,000 according to a police estimate, but that was apparently made before the march started and certainly not at peak attendance, which would have been at the start of the rally in Princes Street Gardens. The main difference, though, was atmosphere. This wasn’t a protest against something, it was a statement of support for something, and the overwhelming mood was positive. At the rally, I listened to about two and a half hours of people giving speeches (interspersed with musical interludes, of which see a couple below), and it was only towards the end of that that we started to get some angry speeches – from trade unionists railing against the current Westminster government. While I could sympathise with their reasons, I’m glad that the majority of speakers were not in that mould. That’s not to say that other speakers didn’t have an occasional dig, but it would be as an aside in a more forward-looking speech. Another good thing its that it clearly wasn’t about one party. Obviously there is one party which has an enormous presence in this debate, but after a speech from the First Eck there were speakers from other parties and none. Margo McDonald was first up, followed in an order I can’t recall by Dennis Canavan and speakers from Labour for Independence, the Greens and the SSP. 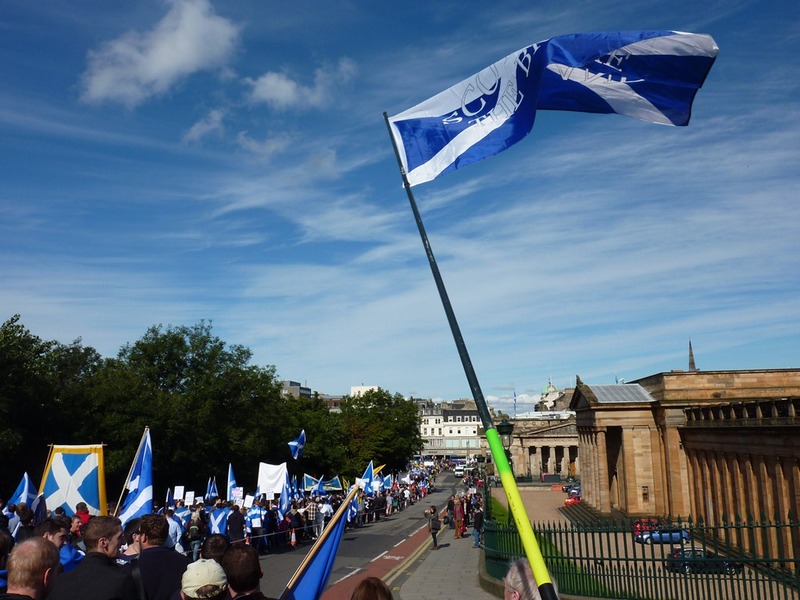 Conspicuous by their official absence were the current parties of Westminster government – which is a shame, as there must be some who have an interest in Scottish independence. I hope someone in those parties has the guts to take the sort of stand against their leadership that the Labour for Independence guy has. One journalist came out in support – the chronologically gifted (her words!) and more-than-usually-worth-reading Ruth Wishart. Anyway, I just wanted to write about the experience of being there, not to change your minds. Having said that, if you want to accompany me next year, that’d be great. If you want to hear "My Generation", Gleadhraich themselves have an earlier performance on YouTube. Glad you had a good time, but no, I don't agree that's the way forward. What we need is a fully federal UK (and ultimately, a federal Europe), with more of a powerspread. I have friends and family in northern England: the London-centric nature of UK government penalises them as much as it does us up here, and I don't want to see them condemned to perpetual enserfment by the City of London and its political arm, the Tory Party. I think there are two possible stable end-points for the constitutional evolution the UK's going through, and one of those is federalism. I would be OK with that. Unfortunately, there's only one UK party that claims to be supportive of federalism. They're as much in power now as they're likely to be for quite a long time, and they're saying nothing about it. When it comes right down to it, I believe independence is the only solution that can be delivered (not easily, but it's within the realms of possibility). I just don't think the political will exists to deliver a federal UK. If independence does happen, I think there'll be some necessary political rebalancing in the rest of the UK, so it won't turn out as doomy as it looks; the electorate there won't want the Tories for ever, and other parties will benefit. The thing is, I'm not sure I will like the Scotland it will create. We should be taking down borders and boundaries, not making new ones. Internationalism, not nationalism. 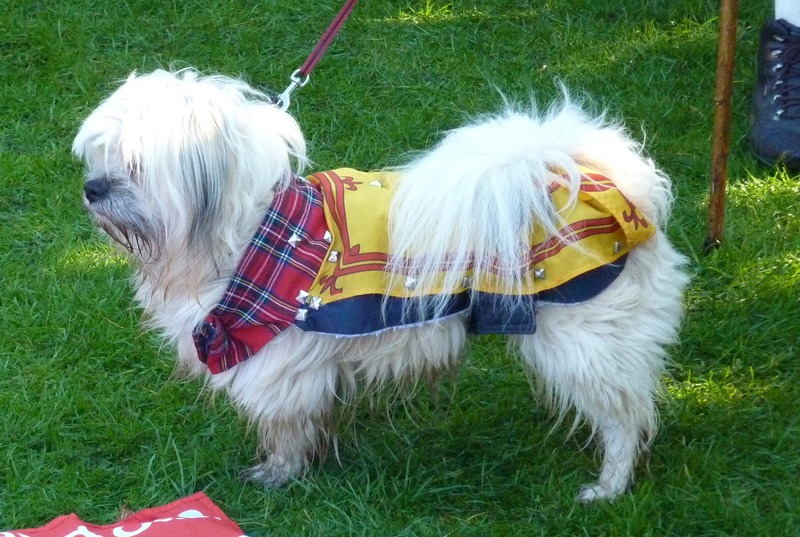 I don't like the UK we're in any more (politically speaking), and think Scotland has the chance and the motivation as a small country to take a more internationalist approach than the rest of the UK is prepared to wear. Of course we have our own problems, but it's not Scotland where UKIP and the BNP are on the verge of being significant parties. the motivation as a small country to take a more internationalist approach than the rest of the UK is prepared to wear. Of course we have our own problems, but it's not Scotland where UKIP and the BNP are on the verge of being significant parties. No, but we have, as you say, our own problems. If you were based on this side of the country you might look at things differently. It concerns me that only the Greens have dared to say anything on ending segregated schooling for the superstitious; that accusations of 'sectarianism' are thrown if you do. Relations with Murdoch and Trump worry me. The love-ins that both Scottish Labour and the SNP have had with American big money worries me. I do not want to see a small country basically run as a theme-park for Americans. All the noise I'm hearing about interactions with the rest of the UK after independence is coming from the people arguing against independence, saying "we won't deal with you after independence". I've not heard anyone on the pro-independence say anything of the sort - they'd be mad to do so, since our biggest and only immediate neighbour would obviously remain important to us. And if it's the people currently in charge that are saying "no deals after independence" - why should we believe they're looking after our best interests now? On your more specific points, they're reasonable concerns but I don't see them being dealt with any better at the UK level. The Greens have more chance of exerting influence up here than at Westminster. And at least if the people responsible are a bit more local we can aye peeble them wi stanes when they arena gude bairns. ;-) Metaphorically, of course.